For those that aren’t familiar with SCUBA Equipment, there are several pieces of equipment that must be checked/serviced on a yearly basis. This includes a visual (inside) inspection of your tank, and all of your regulators (the things that attach to the tank and you use to breathe underwater) must be inspected/serviced. Since this equipment allows you to survive underwater it is kind of important…. My regulator set was a present from my father in law. The set included the first stage (attaches to the tank), pressure gauge, primary regulator (the one I breathe from), and an octopus (a backup for me or a buddy). It was an older Aqua-Lung set that he had inspected/serviced and I have used on MANY occasions, including my liveaboard trip last summer. I recently took my regulator set in to be serviced for 2015 and one item did not pass the inspection since a small crack had developed in the plastic housing. The primary regulator is the one that developed the crack so small that I couldn’t see it, but I didn’t want to take any chances of it failing when I’m 60 to 100 ft. underwater. I don’t know if you have priced any SCUBA equipment recently, but it’s not especially cheap. After some research and shopping, I decided to purchase another older Aqua-Lung regulator since it was similar to the cracked housing with the exception of a metal body so it can’t crack! I found one on eBay and purchased it for approx. $30.00. Even though it wasn’t new, IF it passed inspection, it will last for many, many years! I just picked it up from the local dive shop yesterday. It passed the annual service and inspection – that cost $31. So I have a “new to me” Aqua-Lung Conshelf XIV that’s ready to dive! I attached the newly inspected regulator to my existing set, attached it to a tank, and it performed great! 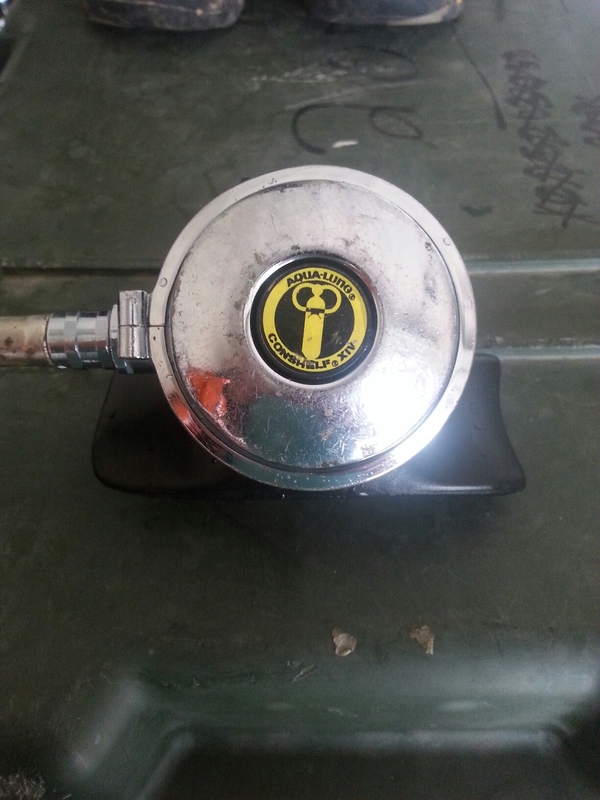 Now I’m looking for another similar model to replace my octopus regulator with a plastic housing….